In his seminal book Meeting Architecture, Maarten Vanneste identifies education, networking and motivation as the 3 pillars around which successful meeting outcomes are based. Thus we go to conferences to learn, connect and be inspired but the selected conference location contributes significantly to all three objectives, particularly the last one. The destination is often what catapults the conference from good to great leaving us with that warm afterglow of motivation, that sense of having done something lasting, worthwhile and meaningful. That’s precisely how I’m feeling now following a week in Southern California during which I experienced a destination that lived up to its reputation for bling while yielding some unexpected and thoroughly pleasant surprises. 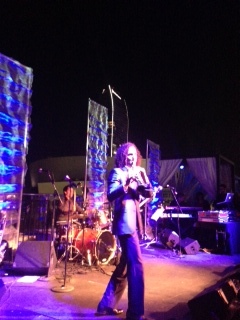 The social and networking part of the FICP conference (see previous posts) delivered 100% on what I expected LA to be: we walked the red carpet, had prom shots taken by paparazzi, partied in privatised night clubs, had celebrities like Tone Loc and Kenny G perform for us. We danced the light fantastic and experienced the superficial sparkle of life in a shiny, bright ultra-material world. Then FICP left town and with it went the rarefied, privileged access to the destination that the conference brought. With an extra day before the long haul home I was on my own to discover what else LA might yield up. Downtown LA has been organised into a series of distinct districts each with its own identity – the South Park District, the Fashion District, Warehouse District etc. The city authorities have done an outstanding job helping visitors navigate the urban spaces with street maps dotted around the various neighbourhoods and signage and colour coding used to identify the various zones. 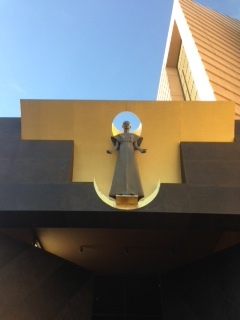 I walked up Bunker Hill from LA Live and enjoyed a couple of hours in the Civic Centre District which clearly draws inspiration from great European cities like London, Paris and Madrid where civic buildings are afforded a spatial context appropriate to their purpose and meaning. 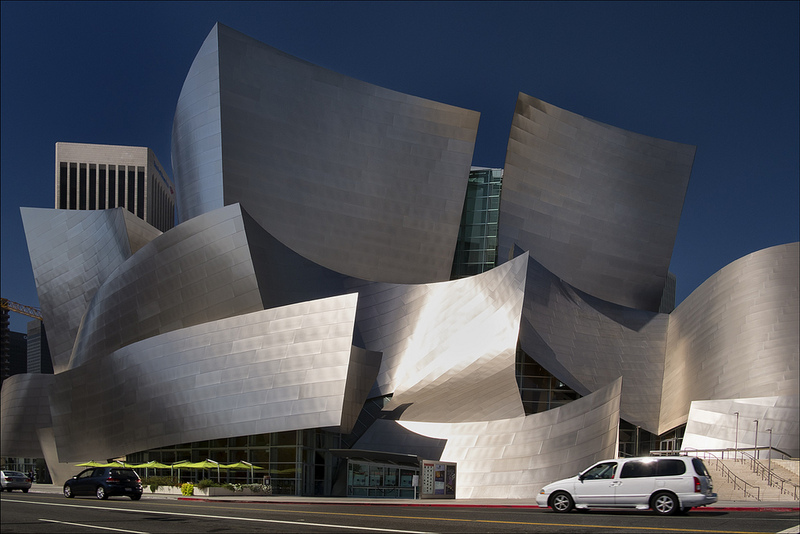 The Frank Gehry designed Disney Theatre with its signature titanium cladding is the fully fanned peacock in the hen coup, an extraordinary, intricate deconstructionist statement that would be worth the visit to LA on its own. Housing the LA Philharmonic Orchestra, its interior acoustics are as remarkable as its exterior appearance and performances take place there without artificial amplification. It can also be hired for private meetings and events. Nearby is the equally astonishing Cathedral of Our Lady of the Angels, a magnificent contemporary edifice constructed between 1995 and 2002 by Spanish born Rafael Moneo under the tutelage of Roger Mahony, Roman Catholic Archbishop of LA. This contemporary religious structure is a modern day equivalent of the great cathedrals built in the Middle Ages throughout Europe – Chartes, Paris, Winchester, Vienna etc. Like the cathedrals of the Middle Ages it was built with donations, big and small, from wealthy Foundations, high net worth individuals and simple, ordinary believers. This being LA all donors are listed in order of the magnitude of the donation, like rolling credits at the end of a Hollywood movie. I experienced a tiny frisson of pride upon noting that the founding donors are all of Irish extraction – the Dan Murphy Foundation and the Donohoe family. Despite its colossal dimensions, the interior is envelopingly warm and beautifully simple. A stunning wall frieze / tapestry of “The Communion of Saints” by native Californian John Nava runs along the perimeter of the 2 facing walls either side of the central altar. Fittingly in LA where celebrity achievement is feted and publicised, this is the “holy” Hall of Fame made up of women, men and children from St Augustine to Mother Teresa whose lives have made a transformative contribution to humankind. Thanks to my great friend Andrea Michaels of Extraordinary Events I also got to experience something of the much celebrated SoCal foodie scene and was treated to an effervescent evening of cool food and hot gossip at Providence, a relatively new 2 star Michelin restaurant on Melrose Avenue in Hollywood. Andrea brought along one of her colleagues, my soul brother in music, Taylor Black (author of Taylor’s Tunes at Andrea’s weekly The Good News Letter). I brought my colleague, the inimitable Maeve O’ Connor. Our spirited high jinks and noisy, clattery conversation drew no disapproval from a highly professional wait team who patiently explained the various menu combinations to us and then left us to our own devises. Sometimes award winning restaurants become hushed epicurean temples and conviviality is forced into second place by arrogant, gastronomic artistry. 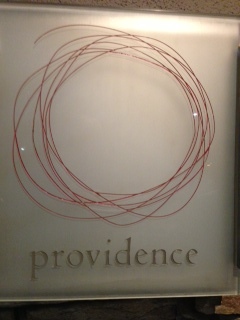 Not so at Providence. Focused predominately on “un-embellished” fish and seafood, co-owners Donato Poto and Michael Cimarusti have created a wonderfully warm environment where traditional Italian values around the familial enjoyment of great food are juxtaposed but not eclipsed by a pursuit of un-compromising cuisine excellence. 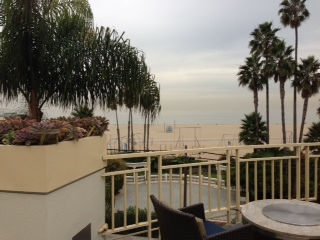 Trevor Hanks of our SoCal partners at the DMC Network, 360Destinations Group, organised a morning in Santa Monica for me to experience something of the famous beach culture of Southern California. Santa Monica is easily accessible from Beverley Hills, Hollywood and LA Downtown as well as from LAX but presents a totally different, much more laid back experience of sunshine, sand and sea. What the hotels there may lack in size and scale they make up for in location and charm. I spent an hour there with Stephen Haller, Director of National Accounts at the Loews, a splendid beach facing property with almost 350 guestrooms. Stephen is passionate about Santa Monica and highlighted how well the city authorities have managed the assets and infrastructure at their disposal, strenuously avoiding the beach front building blitz that has blighted so many seaside destinations all over the world. Net result is, perhaps, a shortage of hotel real estate but this is compensated for by the sheer class and quality of the available experiences – Loews being a perfect case in point. But what can you do with about 30 mins to spare before you head for LAX? I walked along the beach and climbed onto the famous Santa Monica Pier where I took a picture at the “official” (but fictitious!) 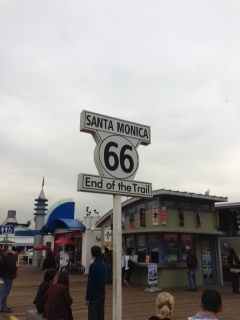 end of Route 66, the famous interstate highway linking Chicago and LA. I ate Clam Chowder at one of the restaurants there and quietly bemoaned the fact that I had no time to go to nearby Malibu to check out the Getty Villa or to visit Bergamot Station which houses the city’s art collection or to patronise McCabe’s Guitar Shop which, besides selling every stringed instrument ever invented, has hosted performances by just about any valid musician you can think of (wish I had been there to see local boy, Jackson Browne). Particular thanks to Andrea at Extraordinary Events and Trevor at 360Destinations for taking care of me when FICP left town. Padraic Gilligan is Vice President of Industry Relations at MCI and Vice President of Ovation Gobal DMC, MCI’s destination services division.